A common feature in web applications is image upload. Images can be stored on disk, in the database, or in some other server. 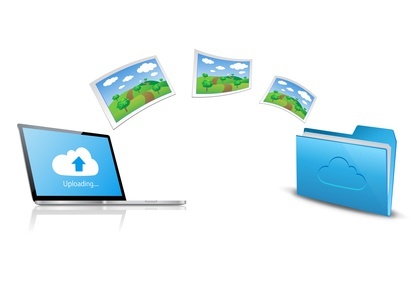 In this post we will take the third approach and store images using Azure Storage. We will also be using AngularJS on the front-end and Web API in the back-end. Whenever we hear the word "Azure", what typically comes to mind is web hosting, database hosting, or virtual machines. Though those might represent the most common uses cases of Azure (or of cloud technology in general), there are other useful services provided by the Azure platform. One of them is Azure Storage. 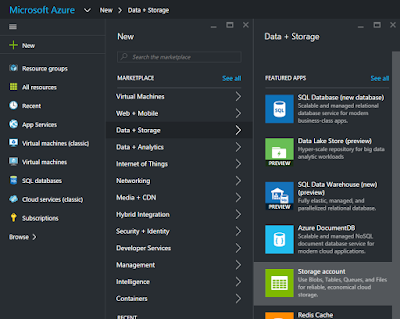 Azure Storage enables us to store data on their cloud server for a fee. This data can come in different formats. 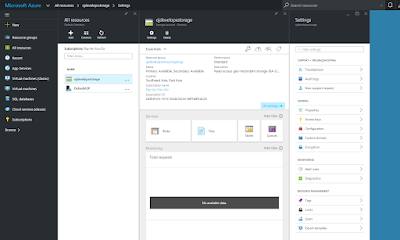 As of the time of this writing, Azure storage offers five services: Blob Storage, File Storage, Disk Storage, Table Storage, and Queue Storage. For this post, we will be focusing on the Blob Storage service. For Blob Storage, fees are dependent on how much data is stored and on the number of operations (retrieve, create, put, list, write, transfer) performed on the data. A complete pricing table can be found here, but in general, the prices are very low. 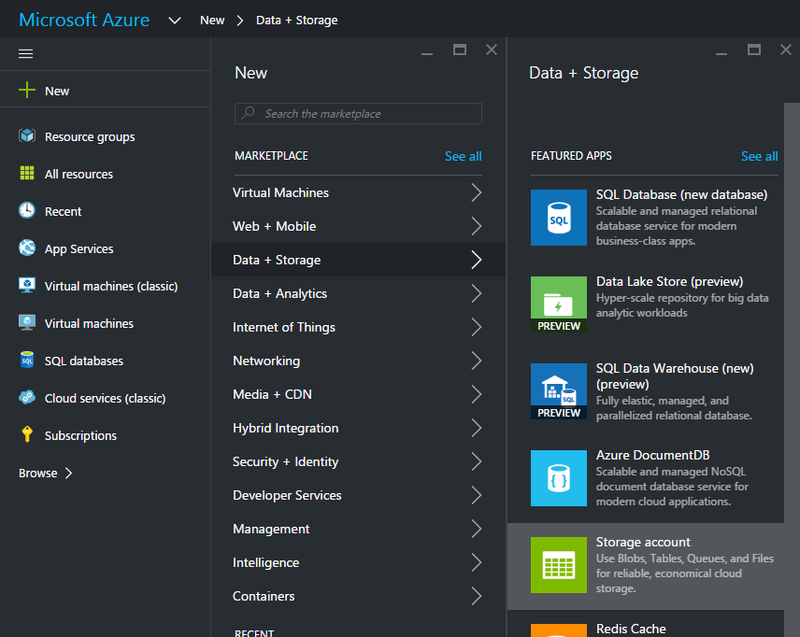 How do you take advantage of Azure Storage? The first step is to have an Azure account. If you don't have an Azure account yet, go ahead and create a free account at https://azure.microsoft.com. 1. On the left sidebar, click on New > Data + Storage > Storage Account. 2. Add a Name for your storage account. You will also be forced to create a new resource group or choose an existing one. Let's create a new one, so fill out the New resource group name. As for the other items, just leave the defaults for now. 3. 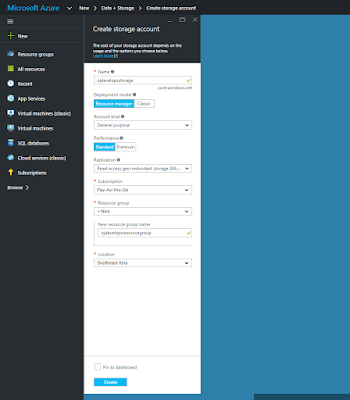 Azure will now provision a new resource group and storage account for you. This can take a few minutes (took around 3 minutes for me). Azure will notify you when it's done. 4. When it's done, on the left sidebar, go to All resources, locate the storage account you just created, and click on it. The details of the storage account appears. 5. Don't get overwhelmed by the amount of information you see - we won't need all of them. For now, on the rightmost blade (Settings), click on Access keys. Copy and set aside the Storage account name, key1, and key2. That's it for account setup. Next, we will install the necessary libraries in Visual Studio. 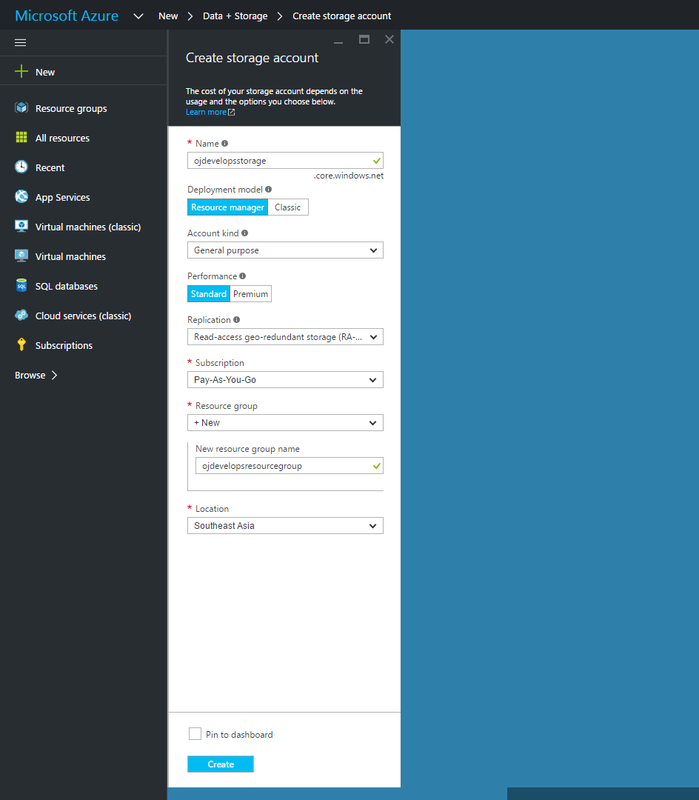 We are going to access Azure Storage from within a web application. To do this, the first step is to download the appropriate Azure Storage NuGet package. In the NuGet Package Manager window, search for WindowsAzure.Storage and install it. During installation, click on "I Accept" for any License Acceptance modals that might appear. How does the SDK know which storage account to connect to? It uses a storage connection string. The storage connection string makes use of the storage account name and the key1, which are the values we took note of earlier. We will be building this controller as we go along. The Azure Storage SDK provides several methods that we can use to access our storage account, including methods to upload, download, delete, and more. Before we can use these methods, we must do a little bit of setup code. For this post, I will be putting the setup code in the controller's constructor. In a real application, it would be better to put the setup code in a class of its own. // We are going to use Blob Storage, so we need a blob client. // Data in blobs are organized in containers. // Here, we create a new, empty container. // We also set the permissions to "Public", so anyone will be able to access the file. // By default, containers are created with private permissions only. We will be storing the CloudBlobContainer into a private field because that's what we will be using to upload and download files. // of the image (the blob) as it appears on the storage server. // the actual filename of the uploaded image. We are using the WebImage helper class to get the image from the request, then using the UploadFromByteArrayAsync method to upload the image (in the form of a byte array) into our storage account. Notice how we are also using a return type of Task<IHttpActionResult> instead of just a regular IHttpActionResult. That is because we are using the UploadFromByteArrayAsync method in the body, which is an async method. Let's leave the backend for now and move to the frontend, where we will be using AngularJS to upload an image. There is no built-in directive that knows how to upload images in AngularJS. Fortunately, there are many plugins built by the Angular community for uploading images. The Upload service is provided by the ng-file-upload module. It has an upload method, which takes an options object, success and error handlers, plus a progress handler. For now we are not really doing anything significant in the success, error, and progress handlers; we are just logging messages to the console. What is important is the options object that we pass in, because that's where we tell the module what our API url is and what the file is as well. The upload method will take care of formatting the HTTP request correctly to incorporate the image, and will also make the HTTP request to our API url. The default HTTP method is POST, though it can be changed to PUT by configuration. The ngf- directives come from the ng-file-upload module, and inject functionality into our div for receiving and handling files. There are many ngf- directives available; we are just using the necessary ngf-select directive as well as a couple of others for validation purposes. We are also using some bootstrap CSS classes for styling purposes. That markup will produce two buttons: a Select button and an Upload button. The Select button lets you choose the file, and the Upload button begins the actual upload. Once we have uploaded an image into Azure Storage and set the permissions as Public (as we did above), we should be able to type in the image URL in the browser to view the image. Did it work for you? Congratulations, you have successfully uploaded an image with AngularJS, Web API, and Azure Storage! In this post we talked about end-to-end image upload, from the front-end all the way to the back-end to Azure Storage. I hope this helps and good luck with your projects!